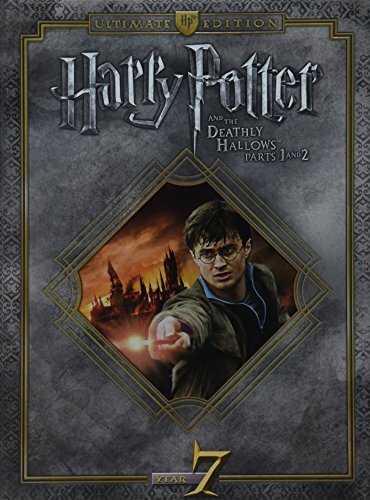 In Part 1, Harry, Ron and Hermione set out on their perilous mission to track down and destroy the secret to Voldemort's immortality and destruction – the Horcruxes. On their own and on the run, the three friends must now rely on one another more than ever…but Dark Forces in their midst threaten to tear them apart. Meanwhile the wizarding world has become a dangerous place. The long-feared war has begun and the Dark Lord has seized control of the Ministry of Magic and even Hogwarts, terrorizing and arresting all who might oppose him. The Chosen One has become the hunted one as the Death Eaters search for Harry with orders to bring him to Voldemort…alive. Part 2 in the epic finale, the battle between the good and evil forces of the wizarding world escalates into an all-out war. The stakes have never been higher and no one is safe. But it is Harry who may be called upon to make the ultimate sacrifice as he draws closer to the climactic showdown with Lord Voldemort. It all ends here.